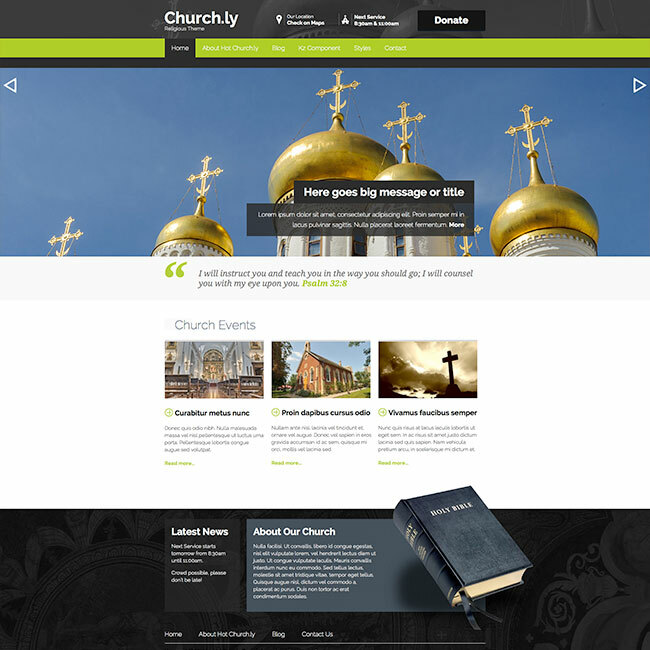 Hot Church.ly is a responsive church template that comes with demo images suitable for the religious communities. 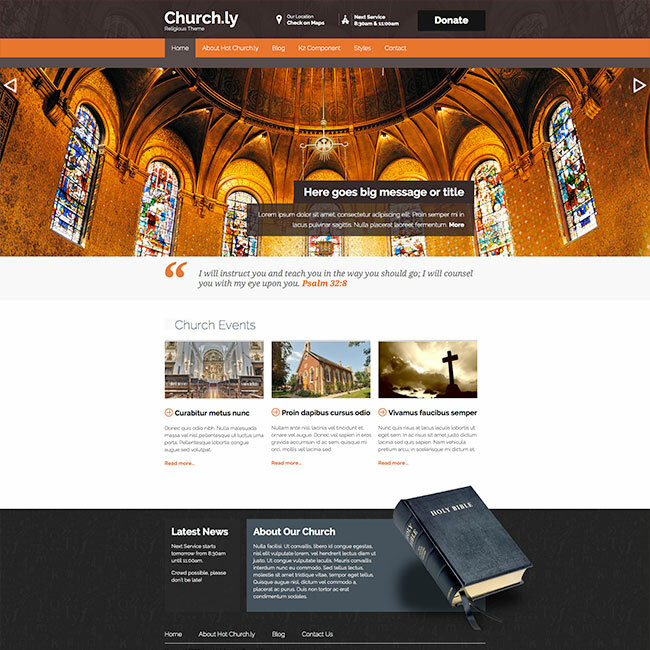 However, Hot Church.ly is a Joomla template based on the Sparky Framework that can be used for any other kind of websites (neutral design). Modern religious communities use the Internet extensively for the propagation of their ideas and for better communication between believers. No matter what religion they propagate, those communities make websites to keep their members informed about local activities and services. 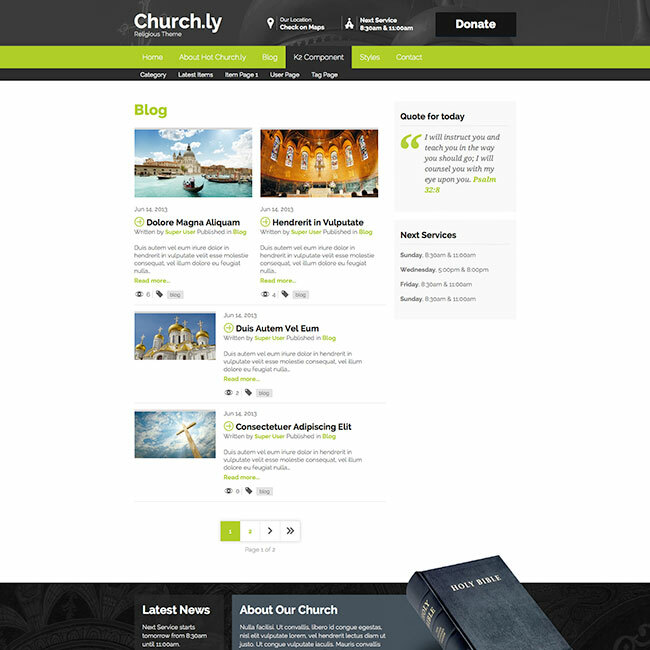 Church template can help you to develop such a website. Also, a contemporary and responsive website can help the community to gain more members and to collect donations from the believers who are temporarily or permanently physically far away from the local community. The church's website can also make the church's members spiritually closer, even if they are not close physically at all. 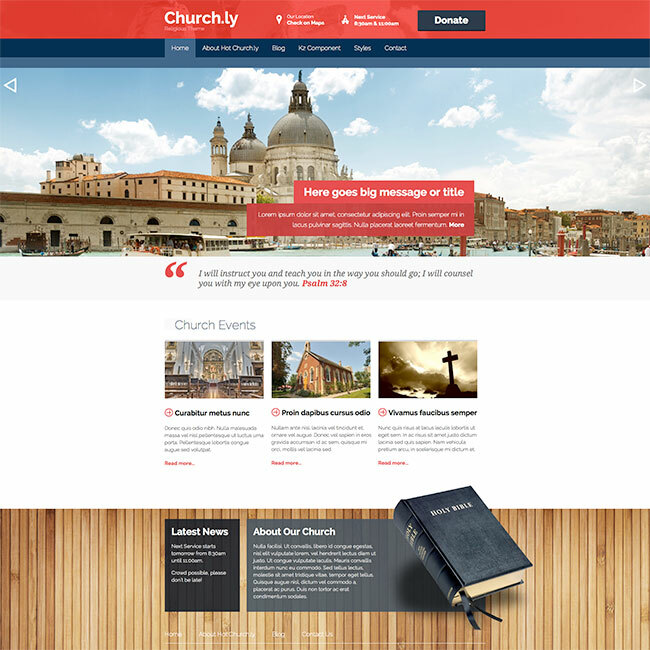 Hot Church.ly is another responsive church template powered by Sparky Framework and equipped with many Joomla modules (slideshows and rotators) that enhance its functionalities. 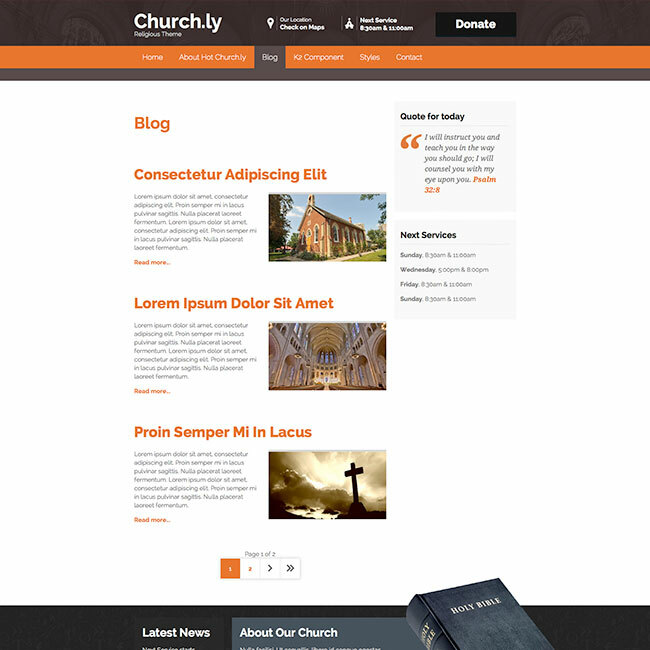 We designed and developed the Church template in good faith. We believe you will find it useful for your religious website or for any other project. We will repeat this again here, after changing our demo images, you will notice this design could be used for any other purpose, not just for church websites. Responsive template, 100% tableless and valid XHTML/CSS code. Based on responsive Sparky Framework for Joomla. Three pre-defined styles with different background and font colors. All colors are easily customizable in Sparky options (infinite color options). Customizable layout powered by Sparky's drag and drop Layout Editor. 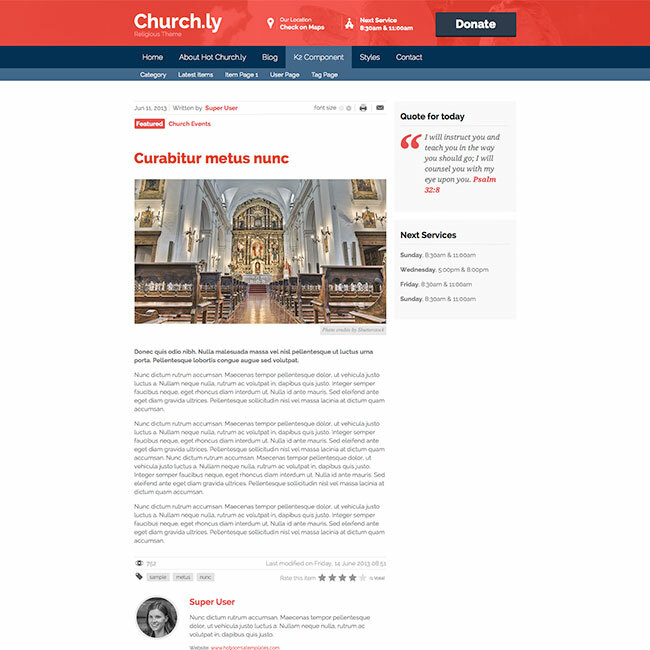 Change layout and element's dimensions of the Church template easily. Hot Full Carousel, Hot Film Tape, Hot Maps, Hot Joomla Carousel, Hot Joomla Gallery and Hot Newsflash extensions are included with template, pre-installed and pre-configured so you can start faster. Full support and styling for popular K2 component is included. All commercial modules used in our template demo are free for you, if you buy the template (you save $15 per module). HotStart (SQL dump) available with both single purchases or membership plans. It copies template with all extensions and demo pages fast and easily. 12 used module positions in our demo. Unlimited number of module positions can be added easily within Sparky Framework, if you need them anywhere in template. Top menu system shows the first and the second level horizontally. The deeper levels are shown in drop-down panes. The menu system is responsive and it will be shown as button on mobile devices. Compatible with IE, Firefox, Chrome, Safari, Opera.